Should Yahoo/Flickr Be Advertising Paid Pro Memberships as “Ad-Free Browsing and Sharing” When They In Fact Plan on Advertsing at Them? Posted on March 30, 2009, 4:09 pm, by Thomas Hawk, under Flickr. Now whatever you think of McDonald’s (personally I’m a huge fan of the Shamrock Shake) the fact that McDonald’s is advertising on Flickr does raise an interesting point about truth in advertising. And that is, why is Yahoo / Flickr promising you an ad free Pro account when you pay up with an annual fee and then turning around and advertising at you? And it’s not just McDonald’s. 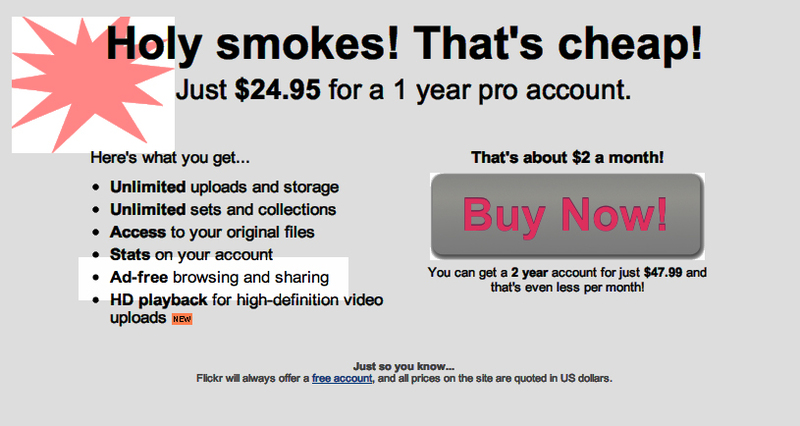 In the past few months several additional companies have now started advertising to paid Pro Flickr Members. In addition to the “Show Us What You’re Made Of” Mickey D’s group. Today I noticed that I could also now share with “Team Visa” what inspires me to “get moving.” By the way, someone should show the “Team Visa” admin how to change their default avatar from the blank flickr face to something more cool looking. “What inspires you to get moving? Send in your photos of people in action— whether it’s an everyday activity like going to the movies, or a titanic event like scaling the Matterhorn, whether it’s swimming with dolphins, or walking the dog. And your pics could appear for Visa campaigns all over the world. That’s it damnit. Cancel that American Express card pronto. The traveling noodle shop in Tibet now takes, yep, you guessed it! VISA! But if McDonald’s and Visa are not enough for you, maybe you ought to check out the Nikon Digital Learning Center. Or how about the Kiss and Be Kissed Group (sponsored by Nivea). Or you can tell Kodak what your story is here. Or you can hang out in the uber cool “Life’s for Sharing” group sponsored by Deutsche Telekom (warning it’s in German). Or check this out. Ford Motor Company is now inviting a few very lucky select flickr members to be a guest editor on their “This is Now” blog through their “This is Now” group on Flickr (your bailout dollars hard at work I guess). All of these groups, by the way, are now prominently displayed on the main groups page for all free *and* paid Pro account Flickr members. My own opinion is that paid members ought to be exempt from having these adverts directed at them. Either that or Flickr ought to drop the “ad-free browsing and sharing” claim from their own advert above. And this post was *not* brought to you by Burger King. Posted on March 25, 2009, 8:46 am, by Thomas Hawk, under Flickr. It’s interesting to see king of the fast food jungle McDonald’s showing up sponsoring the latest group on Flickr. The group, “Show Us What You’re Made Of,” sponsored by “McDonald’s Quality,” would appear to be the latest attempt by corporate America at making inroads into the vast world of social media. I’m not sure how much money Flickr/Yahoo is making on the deal, but I’d assume that they are making at least some as the group says it’s “sponsored” and Flickr has a clear policy against people using Flickr for commercial purposes. This is not the first attempt by a major corporation to establish a presence on a social network (Pepsi has a room on FriendFeed for example and lots of companies are using Twitter), but it is one of the first that I’ve seen on Flickr. McDonald’s does direct people to their own off-site forum for conversations. The pitch for their own forum on their McDonald’s site comes with the invitation promise: “We also think you deserve honest, straightforward answers to your tough questions, so we’ve opened a forum where you can ask us anything about our food quality.” Of course, I’m assuming that this forum will be highly censored and once you get there has a disclaimer that, “please note, not every question will be chosen for a reply.” At present it looks like there are just four questions. 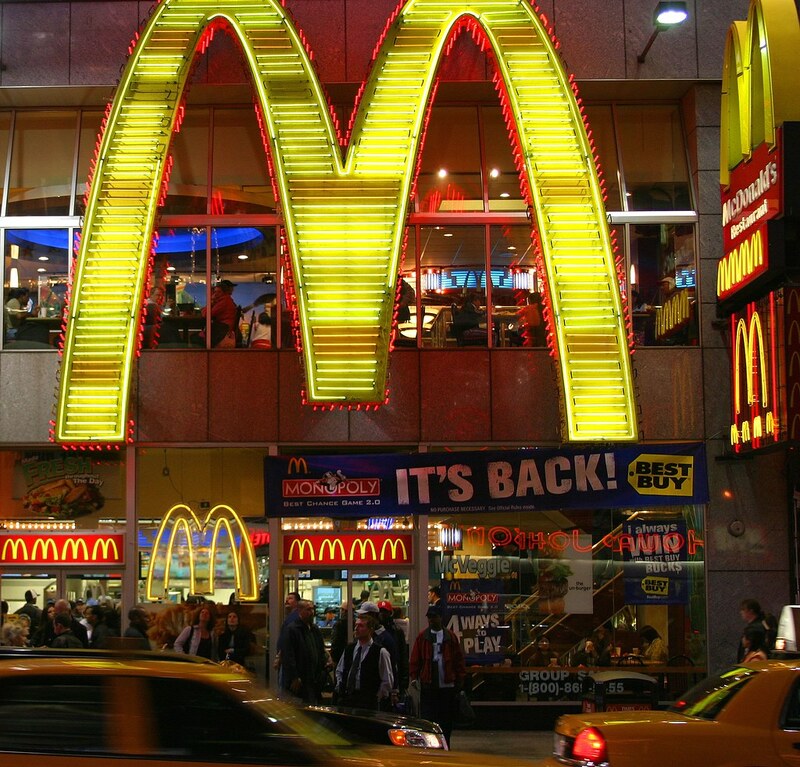 I’d assume that questions by animal rights activists or others who might oppose McDonald’s corporate mission might not be among the “tough questions,” that they choose to answer. Thus far a little over 400 people have joined the group, but because the discussion threads are locked it does not seem very vibrant. The photos in the group’s photo pool generally seem to have nothing to do with McDonald’s and appear to be just random photos submitted by various users. Apparently all photos submitted to the pool are moderated by McDonald’s and already some photos have already been not approved for submission. Certainly corporate American’s foray into social media has begun. In addition to several well known (and in some case suggested) Twitter accounts, it would seem that Flickr may be the next place that Corporate America is looking to sell you more and more of the American fast food dream. And it may be the next place that Yahoo begins looking for to further monetize your Flickr experience. In addition to the “official” McDonald’s group on Flickr, there does seem to be a much more active unofficial McDonald’s group on Flickr here. You can see my set of McDonald’s imagery on Flickr here.